I've been working too hard. I have one employee, and she has been ill, so I have to do everything myself. Good news/bad news I had a lot of work come in for delivery in early July. Today is the 4th and I'm NOT working. Thursday was yard day. I had pulled out some Tiger Lilies and wanted to fill in the space. We now have another iris and some cone flowers. Our son wants Tiger Lilies when more get pulled out. We just have too many! Variety is the spice of life and I'm slowly getting some in our yard. 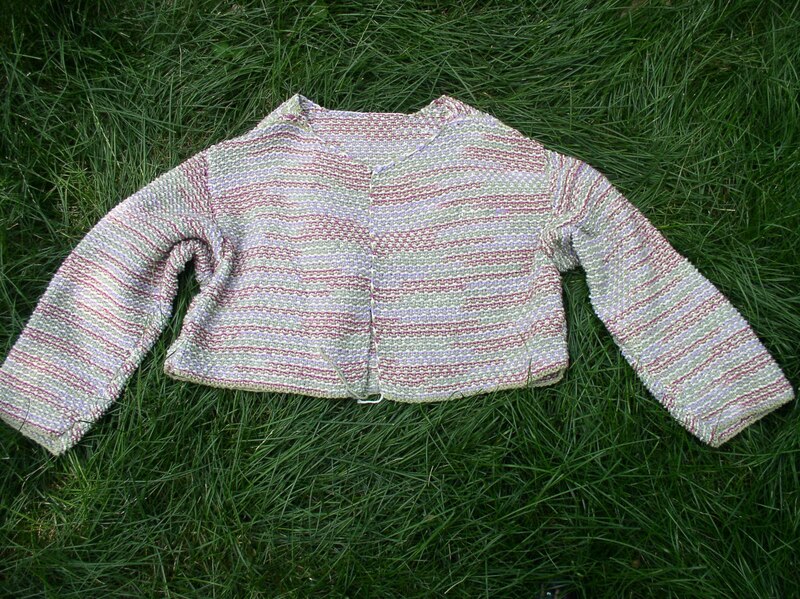 This jacket was started last summer. 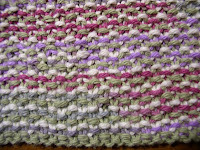 It's 3 color seed stitch from dishcloth cotton. 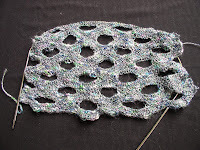 It will have lace borders. 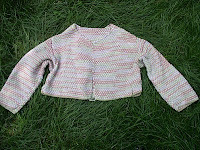 The pattern is adapted from a Vogue sewing pattern. The variegated yarn was bought about 20 years ago. Finally most of it is gone. The rest will become part of a baby sweater. 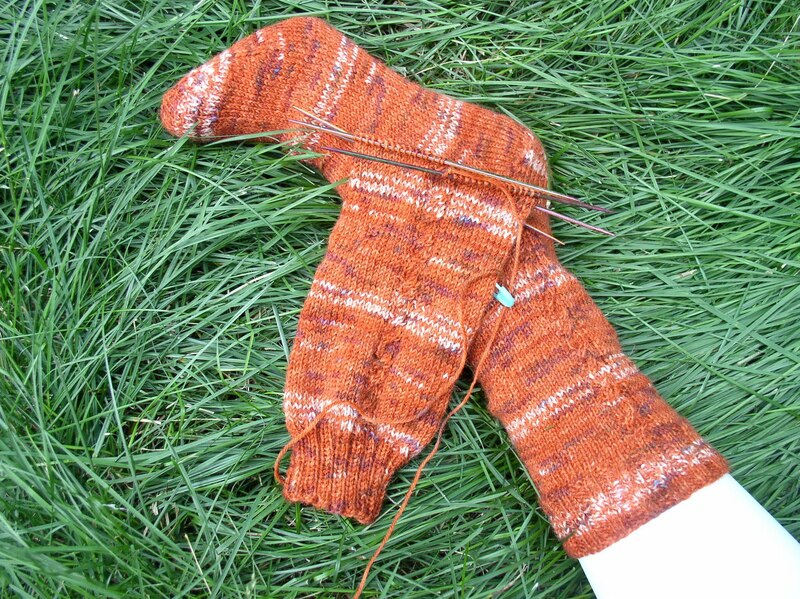 The orange socks are nearing completion. Translating the pattern from 1944 has proved interesting. 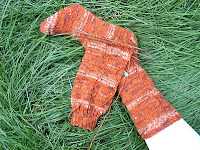 It's a fairly simple pattern with cabled "clocks" down each side of the leg. The cable pattern was written out; Rnd 1, rnd 2, rnd 3, rnd 4 like rnd 2, rnd 5 like rnd 1... for 12 rounds. I charted it so that I could see how many rounds between cable crossings. There are no ssk decreases, but the gusset does have skp decreases, so the same thing essentially. The heel flap is short for all sizes. Did I say that the pattern was for men? I downsized it, shortening the ribbing from 5" to 1 1/2". I needed to do more cables that written to make them the length I like. The toes are a typical wedge toe, but all decreases are k2tog. The yarn is from Lana Grossa. When I went to TNNA in Columbus, OH, I made contact with Cascade Yarn Co. 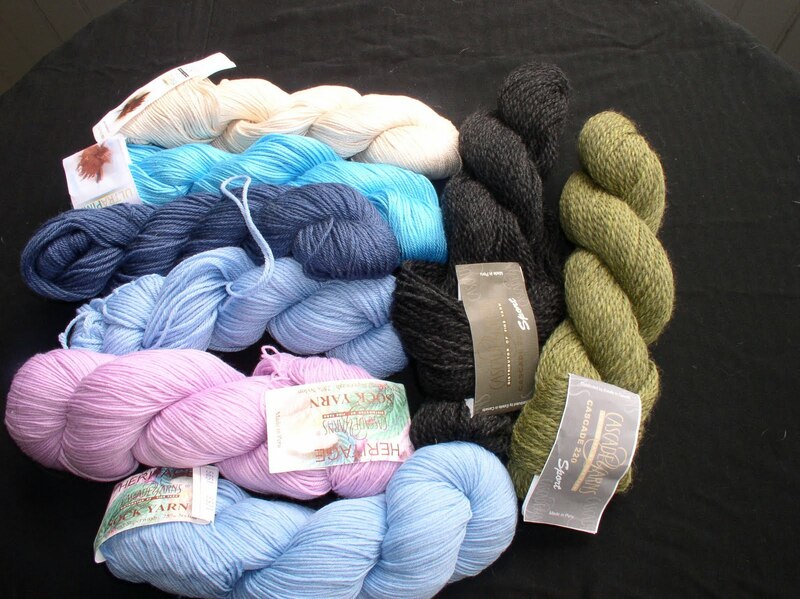 They want me to design a shawl and sent me some yarn. 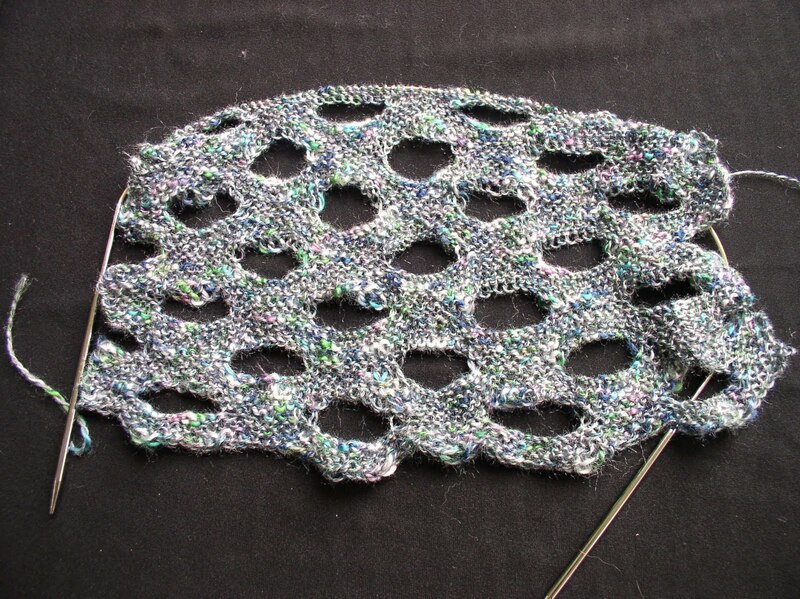 They have a new sport yarn coming out and was the shawl from sport weight. First I have to finish some socks for Plymouth. They also want a shawl. More stealth knitting for money. Our knitting guild has a Knit Along of a scarf. The chosen pattern is a free one called the Swiss Cheese Scarf. Mine looks like this, but now it is twice as long. 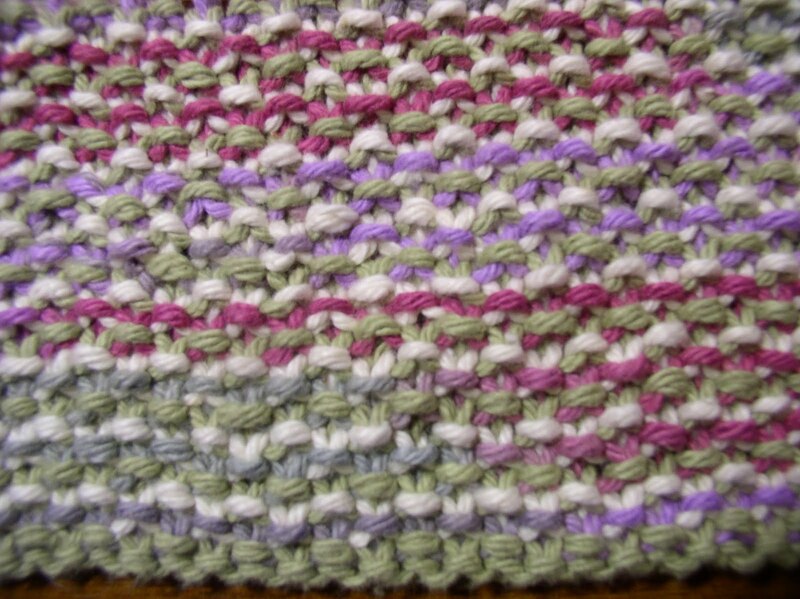 The pattern consists of garter stitch and buttonholes, lots of buttonholes. I'm using cone yarn. which has a gray base and the second ply has lots of other colors.